The youngest assailant of the war? Today's research began with the 5th (militia) battalion Royal Irish Rifles, moved on to expanding the gazetteer and finally uncovering the tragic death of a British soldier shot by a six year old boy. Such are the avenues opened by researching for The Register, one must be disciplined to stay on course! On May 17th, 1901 an outpost of the Royal Irish was attacked by 100 Boers near Leeuwspruit. They kept the Boers at bay until all their ammunition was exhausted, three men were wounded, one fatally, all were captured. Unfortunately this episode is not recorded in Surrenders (WO108/372). The casualty roll records the location as either Leeuwspruit or Wolvehoek; which is correct or are they different places? Such questions have to be answered to make The Register accurate and help researchers know the facts and add colour to their findings. 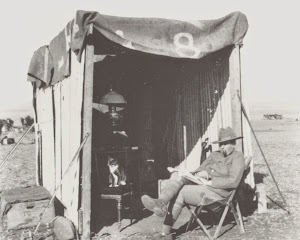 In the published gazetteer (A Gazetteer of the Second Anglo-Boer War 1899-1902 HM & MGM Jones, Military Press, 1999) there is only one Leeuwspruit, the location where, on June 14th 1900, Lord Kitchener fled for his life across the veldt when the train he was travelling in was halted by the Boers. Later that evening the Boers attacked two trains and a construction party capturing 350 men (not all soldiers). To identify the location of a place one useful resource is Steve Watt's In Memoriam which gives burial locations (where known). In The Register there are 70 men whose casualty location from the official casualty rolls is "Leeuwspruit". Refining this list by date one can identify individuals not connected with the June 14th attack or the Royal Irish Rifles. Using In Memoriam to check the burial places I have added three Leeuwspruits to the gazetteer; one in the Free State and two what was the Transvaal. All the "Leeuwspruit" casualties now have gazetteer entries. So, what of the six year old boy? In Watt the place Orebyfontein is mentioned alongside Leeuwspruit. Orebyfontein is not mentioned in the gazetteer, there are three casualties for the 1st Dragoon Guards - two officers and one man. In creating the gazetteer Orebyfontein did not feature in any of the initial sources used - mostly contemporary accounts which do not seem to have reported this incident. Whilst skirmishing Pte 4163 HH Hughes 1st King Dragoon Guards was fatally wounded by a six year old Boer boy who approached and shot him in the abdomen with a concealed pistol. Cpt EA Williams was killed and Lt HH Harris wounded in the skirmish. A report to the War Office was made by Sgt C Probertts of Pte Hughes' troop and his comrade Pte MF Elmer. I cannot find any further trace in the newspapers about this incident. But, now the fate Pte of Hughes is permanently recorded. Splitting Groups - Good business or greed? 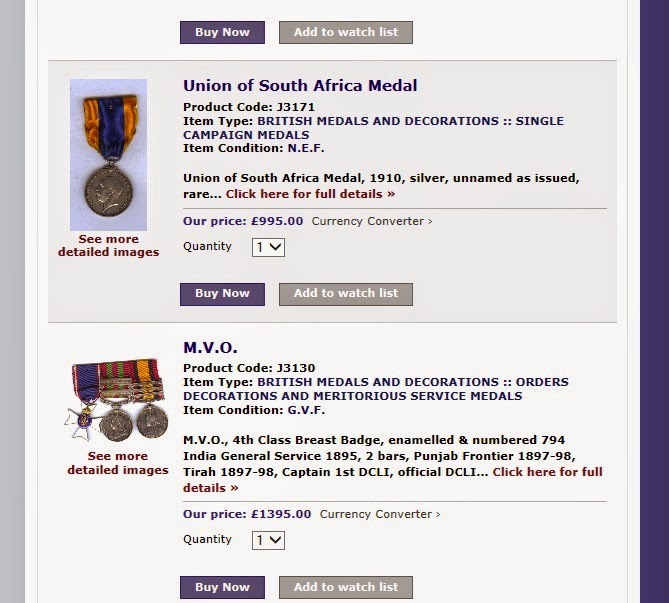 For as long as medals have been bought and sold groups of medals have been split up, you just have to browse a few dealer's list to see how many single medals are missing their mates. The reasons are many; the owner could split them amongst his descendants so they have one each (my Great-Uncle did this), medals get lost (then a singleton is discovered in the back of drawer by the house clearance folk) and there is the deliberate action by collectors and dealers. Collectors will split a group because they are only interested in one of the medals. They also do this to increase profit - or try to. A recent example from Liverpool Medals is the splendid group to Colonel FH Chapman Duke of Cornwall's Light Infantry: MVO, IGS, QSA and Union of South Africa Commemoration Medal. The group was sold by the Truro Auction Centre in August 2014 for £1600. It appeared on Liverpool Medals' website the next month in two parts; the three campaign medals for £1395 and the Union medal for £995. 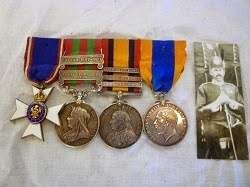 You can easily tell it is the same Union medal by a pin hole in the top centre of the blue stripe on the ribbon. The two lots remain unsold. This is a huge shame as the Union medal is rare and is issued unnamed. Colonel Chapman's entitlement is verified. If the group remains separated then in the future Colonel Chapman's entitlement to the Union medal could be lost. This is an important point relevant to all split groups; how many sources does a collector search in the hope someone was entitled to a rare or unusual medal? The Register is recording as many QSA and KSAs it can that are offered for sale or known to exist in private collections. In this way groups such as Colonel Chapman's are being recorded for posterity. Unfortunately The Register can't afford to reunite such groups - or more importantly refuses to feed the greed of Liverpool Medals. The split that prompted my conversation with Liverpool Medals over their policy concerned the medals to Pte 6270 JJ Jackson Northumberland Fusiliers: QSA, KSA, 1914-15 Star trio (RAMC & CAHTC) and Silver War Badge. Sold by Alec Kaplan & Sons, Johannesburg in May 2013. Liverpool Medals bought it and split the QSA and KSA from the WW1 medals (the SWB was not with the group sold by Kaplans), because they could sell the QSA & KSA to a Northumberland's collector quickly and they didn't believe it was to the same man. Jackson was discharged in South Africa so could easily have earned the WW1 medals. Most dealers would not split the group together and leave it to a keen collector to prove the group. 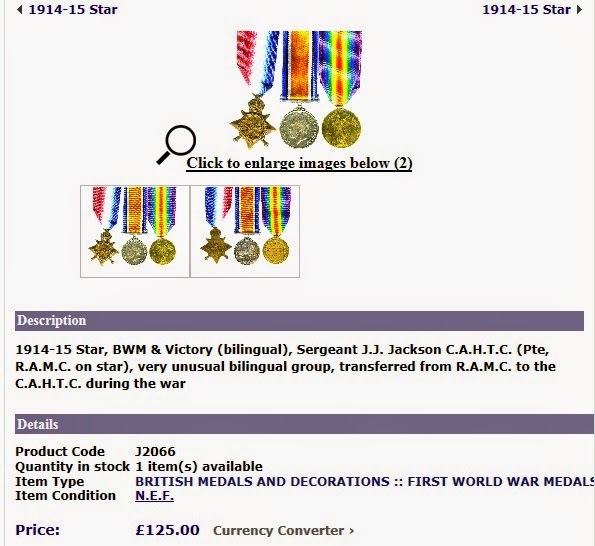 Jackson's QSA & KSA were sold quickly, the WW1 trio languish on the website. Collectors strip out (or lose) medals. The QSA, Kimberley Star pair to Cpl 86 J Laskey Kimberley Light Horse have been sold in 2011 and 2014. In February the QSA only turns up with London Medals, a discussion with them indicates they only bought the QSA, not having seen the Kimberley Star. This is annoying but not disastrous, the Kimberley Star was issued unnamed to all defenders of Kimberley and there is no roll. Unlike the examples above, one can easily tell if a man was eligible for the Kimberley Star. Laskey's missing Star is unfortunate but not irretrievable. In the upcoming Bene Merenti Auktionen sale they are offering the group to Lt-Colonel S Bogle-Smith 2nd Dragoon Guards and Remounts. This group was sold in 1962 and 2014, now it is missing and Austrian Order of the Iron Crown. Why? I don't know, I just hope the Order has not been stripped out for a collection or for profit.